I returned home from vacation to a garden that looks basically the same as before I left. The carrots are still an inch long. The eggplants are still barren. Two dainty yellow squash hide beneath the leaves of tidy little plants. Guys, you had a “Home Alone” moment and you blew it? I was gone almost a month and nobody went wild? The only bright spot was the tomatoes, which produced about 10 nice red and yellow globes ripe for eating. That’s not a great harvest for 12 plants, but it is more than Tony and I can eat before they spoil, so I had to get creative. After a couple rounds of tomato sandwiches and sliced tomatoes with Japanese mayo and hot sauce (Tony’s idea), I tried to think of different ways to serve sliced tomatoes. 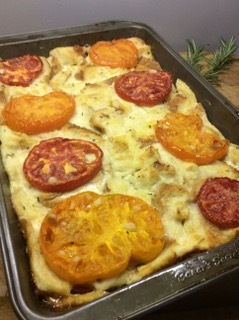 The result of my brainstorming was a comforting casserole of tomato slices layered with garlic-Parmesan bread pudding. I added a scant bit of minced fresh rosemary because my potted specimen outperformed all the other herbs this year. This casserole would be great to take to a pot luck because it looks enticing and actually improves in flavor and texture with standing. When hot from the oven it is a bit soupy. It firms up as it cools, and the flavors also mellow. I enjoyed it both at room temperature and cold. I served it as a side dish at dinner and the main event at lunch the next day. I even snuck a piece for breakfast, telling myself that eggs, bread and milk are proper morning foods. Different colors of tomatoes make for a gorgeous casserole. Preheat oven to 375 degrees and oil a 9-by-13-inch pan with vegetable oil spray. Combine milk and garlic in a 2-quart saucepan. Bring just to a boil. Remove from heat, cover and let steep for 30 minutes. Uncover and remove garlic with a slotted spoon or by straining. Cool milk to room temperature. Place bread cubes in a large bowl. In a medium bowl, beat eggs with one-half cup Parmesan and salt. Whisk steeped milk into the egg mixture. Pour over bread cubes, pressing down with a spoon to soak all of the cubes. Let stand for 10 to 15 minutes. Spread a single layer of soaked bread cubes in the prepared pan. Place 8 tomato slices over the bread. Sprinkle with half the rosemary. Top with remaining bread cubes and any milk mixture left in the bowl. Arrange remaining tomato slices on top. Sprinkle with the remaining rosemary and 2 tablespoons Parmesan. Bake at 375 degrees for 50 to 60 minutes, until top just starts to puff. Remove from oven and cool to room temperature before cutting into squares. Makes 8 servings. Sliced tomatoes with homemade pesto; grilled steak salad, corn on the cob; sliced baked tomatoes with garlic-Parmesan bread pudding, mustard-glazed hamburgers with grilled onion slices. Pork tamales at a farmers’ market in Canon City, Colo.; cold ramen noodle salad with tempura shrimp at Tensuke Express in Columbus; Hawaiian pizza (yes, pineapple on pizza) from Rizzi’s Pizza in Copley; a hot dog with mustard and relish from a sidewalk vendor in Cleveland. Note: Ham and pineapple pizza is Tony’s favorite (we alternate picks), but truthfully, I’ve come to like it. Ages ago (maybe 6 years?) you had a recipe for Crockpot Ribs. They were easy to make, no cleanup to speak of, and absolutely DELISH!!!! I have gone through all of my recipes and cannot find it. I’m hoping that you will be able to come up with this recipe. Arrange ribs and onions in the slow cooker in alternating layers. Combine barbecue sauce and honey in a medium-size bowl and mix until smooth. Spoon over the ribs. If you have a round slow cooker, spoon the sauce between the layers, too. Cover and cook on low until tender and the meat starts to separate from the bone, 8 to 9 hours. Transfer ribs to a platter. Serve any extra sauce remaining in the pot in a bowl on the side. Serves 4 to 6. I want to try a recipe for Spanish Style Ribs with Salsa Verde I got from the Beacon Journal. Any idea if the Spanish paprika mentioned is actually smoked paprika? The recipe wasn’t clear whether it was or not. I tried to do an Internet search and got nowhere. Regarding your search for locally sourced meat, we belong to a CSA run by Jason Bindel of Bindel Farms in Spencer. We get chickens and eggs as part of our CSA share plus a turkey at Thanksgiving. It’s a bit of a drive but this fall will be the third hog we have gotten from Jason, who raises heritage bred Tamworth pigs. If you haven’t tried heritage pork, you need to. You won’t be buying any commercial pork anymore. That’s bland and full of who knows what compared to heritage bred pork. Giant Eagle Marketplace in Green and Cuyahoga Falls carry heritage Berkshire pork if you want to try it. Thats where I go if I run out before our Bindel pork is ready. Also, this fall will be our third time getting a half a cow from Mark Roesner at Copley Feed & Supply. We’ve been very happy with the beef. There’s nothing better than having cows raised locally under humane conditions and almost organic. We’ve been healthier since we buy meat from local farmers. Dear Kelly: I hope you don’t mind that I shared so much of your letter, but the information will be of interest to a lot of people. Regarding Spanish paprika, I’m pretty sure your recipe is calling for smoked paprika. The spice stores I called carry only smoked in the Spanish paprika. My research tells me that smoking is the standard way peppers for paprika are processed in Spain. This is probably a stupid question and I’ve been cooking for more years than you’ve been alive BUT how long can you keep a cooked chicken in the fridge? I love to buy a whole chicken to roast and have leftovers for more meals. There are just the two of us. I know I can freeze the leftovers but I don’t always like the taste of frozen cooked meat. And we don’t seem to eat as much as we used to. So if I make chicken salad the day after the roast chicken, when should I toss it? I have a friend who keeps food forever and hasn’t killed anyone yet. I always think I toss it too quickly. So, you’re the expert, what do you do? 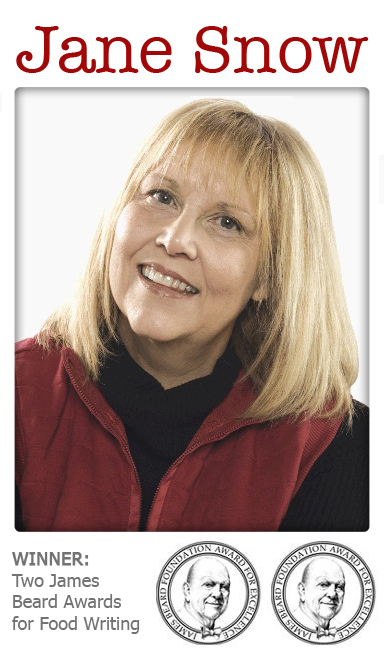 Dear Sue: The standard line from food-safety types is to keep cooked poultry for no longer than four days in the refrigerator. I sometimes fudge that by a day if the chicken still smells fresh. Providing the cooked chicken has been kept cold (below 40 degrees) at all times, the food-safety danger is not from bacteria but from spoilage — essentially, age. Scientists I’ve interviewed in the past have said rotting food, as unappetizing as that sounds, is not as much of a health hazard as bacteria-infected food. In sum, if you want to be very safe (if a member of your household has a compromised immune system, for example), keep cooked poultry cold and pitch it after four days. Otherwise, rely on your nose and common sense. Regarding your question on where to buy high-quality seafood: Earthfare has good, fresh seafood. It’s the only place I will buy it other than Bay Lobster. Costco sells great fish — yes, in quantity but I separate, label and date the package.